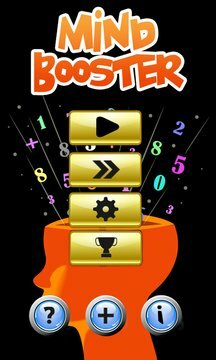 Mind Booster is an interesting game which helps you to increase your typing speed and let you enjoy with numeric keypad. Each person can find his mind’s activeness by playing this game for boosting his mind. High ranking Score will be listed on the top of Scoreboard. There is setting option with which you can set the desire type of game as. 1) Speed: You can set your speed as slow, medium or fast. Random numbers will be reflected as per desired speed. 2) Difficulty: In Easy mode you can type until the count of game numbers reaches the limit specified by player and in hard mode you have to type exactly with the game numbers. 3) Sound: you can set on/off the sound for this memory game . 4) Maximum Digit: provides you to choose number of digits to play the mind game. Life: The given life as a chance to mismatch is 5. Race against the matching times i.e. Life, each time you type correct Life persists. When you type a wrong number for the brain twisting game , you lose a Life. You can submit your score globally and challenge your friends to crack this. Now you are ready to play the Mind Booster. Enjoy the memory based, visual puzzle like game as mind boosting game. Go, get it and challenge yourself and make your friends to crack your record!